Outside the morgue at Diyarbakir cemetery in eastern Turkey, Hanifi Cam waits for the body of his 24-year-old daughter, Gulsum, to be draped in Kurdish nationalist red, yellow and green. Gulsum was a Kurd from Turkey, but she trained with militants from the Kurdistan Worker's Party (PKK) in the Qandil Mountains of Iraqi Kurdistan, and died in combat in Kobane, a Kurdish-run town in Syria. As the bodies of Kurdish children killed in Syria or Iraq come home for burial in Turkey, feelings of cross-border Kurdish solidarity are growing in their communities, despite the deeply divided nature of the Kurdish nationalist movement. Gulsum's family makes no distinction between the three separate regions. "Kurdish fighters from all parts of Kurdistan went to Kobane," her father said. "This means that the Kurds are coming together." Funerals for PKK fighters killed abroad are becoming more commonplace in this part of Turkey. In recent months, the PKK and its Syrian sister group, the YPG, have emerged among the most prominent and effective forces against Islamic State (IS) in Iraq and Syria. The coffin emerges, hoisted by several women, and the large crowd begins chanting in Kurdish, "Martyrs never die". The women carry the body into a hearse, and the funeral convoy starts driving toward Akbas, the village where Gulsum grew up and where she will be buried. Image caption Gulsum Cam's uncle described her as a "martyr of Kurdistan"
An armoured Turkish police car heads the convoy - an imposition of the state that nobody here wanted. As the convoy passes through urban areas, people pour out on to the streets to salute it. 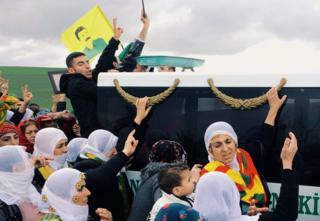 Kurdish women wail, wearing headscarves that more closely resemble Venetian handkerchiefs than Islamic veils, and young boys flash victory signs with one hand and raise posters of Abdullah Ocalan, the imprisoned leader of the PKK, with the other. In the face of a common enemy in IS, public demand for Kurdish unity across borders is growing, and is beginning to influence the policies of rival Kurdish leaders. The PKK gained popularity in Iraqi Kurdistan when the group's fighters rescued Yazidis trapped on Mount Sinjar and fought IS along frontlines in Kirkuk, Makhmour and Gwer. Iraqi Kurdish leader Massoud Barzani gained credibility among Kurds in Turkey when he sent a group of up to 200 Iraqi Kurdish peshmerga fighters to fight alongside the YPG in Kobane. Videos of Iraqi Kurds cheering on the PKK in Kirkuk, and of Turkish Kurds doing the same for the peshmerga convoy as it passed through Turkey, are passed around Kurdish social media networks. As the borders blur, Kurdish leaders may increasingly have to play to Kurdish public opinion across country lines to stay on top. Thousands of young Kurds like Gulsum have left home to join the PKK, driven by a combination of factors. All are inspired by the guerrilla group's brand of Kurdish nationalism, some are fleeing to avoid serving prison sentences in Turkey, and others are escaping poverty or other repression. Yet, at the same time, hundreds of Kurds have also joined Islamic State, often for the same reasons as many European Islamists. Disgruntled youths have turned to the extremist group for a new source of identity, out of a sense of alienation from mainstream (mostly secular) Kurdish politics and under the influence of online propaganda. The contrast of a young Kurdish woman like Gulsum, empowered by the PKK's resolutely egalitarian ideology, fighting a Kurdish IS militant with an Islamist beard, starkly illustrates one of the new and increasingly prominent tensions in this part of the Middle East. Kurdish nationalism, a largely secular tradition, is up against political Islam, a relatively new phenomenon among Kurds, which has gained strength across the Middle East since the so-called Arab Spring. Kurdish public opinion is increasingly looking to its rival leaders to join together in the face of Islamic State, even though the political divisions within the nationalist movement remain largely intact across the borders of Turkey, Iraq and Syria. And that demand for unity based on ethnic kinship grows stronger with stories such as that of Gulsum Cam. Her cousin, a girl too young to have connected with many Kurds outside her village, much less across borders, insists: "They are also Kurds [in Syria], so they are the same people for us. This is the same land."